A cup of coffee is something one looks forward to while working late to finish the project. But, with increasing negligence of one’s body clock, bad eating habits and lack of proper exercise come with inevitable health problems, especially hypertension, forcing an already suffering person to think twice before taking up their much-needed caffeine boost. There are many things that link coffee and blood pressure together. Caffeine is said to cause sudden jolts in the proper movement of blood in the arteries and veins. As a result, more and more people are reluctantly dumping their beloved beverage to save their troubled hearts. The question that arises is - just how true this statement is? Do we really need to quit caffeine? In order to have a proper understanding of the situation in hand, we need to know about the effects of caffeine on our blood pressure. Caffeine, an alkaloid compound that is generally found in the widely adopted beverages such as tea or coffee, helps in “awakening” of our central nervous system. It makes us feel alert and focused for a long period of time. But anything in excess causes troubles and the same goes for your caffeine intake. High intake paves way for blood vessel constriction, which may lead to an increase in blood pressure. But the keyword is “may”: researchers are still debating over the relation between coffee and blood pressure. 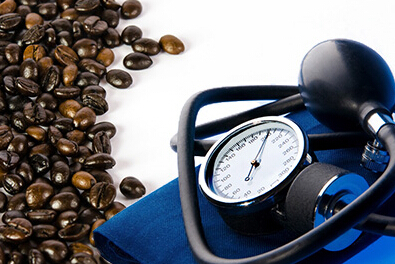 In cases of people with normal blood pressure, the effect of caffeine on them is debatable. Some researchers argue that it causes a certain jump in blood pressure, although the mechanism involved is still unknown. The hypothesis is that caffeine is either responsible for blocking of a particular hormone that helps in stimulating the width of arteries or has an immaculate effect on adrenaline secretion, hence increasing blood pressure. However, the studies performed on many normal people stated that such effects were short-lived with no long-term changes when it comes to blood pressure. The statistics reports by a large French retrospective analysis find out that caffeine provides a tiny yet notable depletion in systolic and diastolic blood pressure along with lowering of pulse pressure and heart rate. This study was conducted over the span of a decade on more than 85,000 women, and it was seen that even drinking 6 cups of coffee every day didn’t bring them any risk of increased blood pressure or any heart-related diseases. This fact has been supported by the Joint National Committee on Hypertension as well. There is no evidence to indicate causation between coffee and high blood pressure. Sadly, the joy of having a carefree dosage of coffee doesn’t get awarded to people suffering from high blood pressure. Researchers have found that caffeine’s effect of elevating blood pressure is greater on those diagnosed with hypertension, as well as for overweighed or elderly (70 years of age or older) males. For those, it is advised to watch out for caffeine intake. However, there is no need to be low on hopes; we have come up with some steps to follow for a controlled blood pressure. If you have hypertension and are wondering whether you should avoid coffee drinking, consult your doctor. You can start by lowering your intake firstbefore bringing it to zero to avoid withdrawal after-effects. If you are having normal vitals but you are still worried about the after-troubles in relation to coffee and blood pressure on your body, you can limit your caffeine intake for a certain period and note the results. Try reducing your daily intake of caffeine to 200 milligrams: that is around 2 ounce-cups (355 millilitres each). You can even check whether a certain coffee brand is causing an increase of blood pressure in your system by noting down your blood pressure in between 30 to 120 minutes of your daily coffee intake. An increase of blood pressure by 5-10 points indicates that you might be under the blood pressure elevating effect of caffeine. Remember, even with normal people, caffeine intake just before rigorous activities increases your blood pressure, so avoid that. Go for power walks: walking has always been a healthy option. Better oxygen supply in the body keeps your heart healthy. You can participate in vigorous cardio workout for at least 30 minutes daily. Never forget to challenge yourself with speed and distance whilst walking. Take deep breaths: taking slow yet deep breaths on a regular basis has a huge impact on our health. It lowers our stress hormones, helps you focus better by elevating renin, a kidney enzyme that helps in controlling blood pressure. So, breathe in and out deeply for at least 5 times a day. Consume potassium-rich foods: involve potassium-rich food and vegetable options in your diet like tomatoes, bananas, kidney beans, melons, sweet potatoes and dry fruits such as prunes andraisins so that you are better guarded against brimming hypertension. Have a control over your salt-intake: many people with a long running history of hypertension in their families are sodium-sensitive. Salt may bring flavour to your savouries but uncontrolled intake can mess with your blood pressure levels. Try keeping your daily salt intake to 1,500 mg.
Search for a supplement: when it comes to lowering blood pressure, supplements like coenzyme Q10 has shown great result of reducing blood pressure by up to 17 mmHg over 10 mmHg. Before taking it, consult your doctor first about the dosage.